Appointment Reminder is an booking reminder scheduling tool for businesses which can be integrated with existing booking calendars including Google Calendar, Outlook and iCalendar to send reminders to clients. By providing users with the tools to set up and automate appointment reminders in SMS or email format, Appointment Reminder aims to help businesses reduce the number of no-shows, save staff time which can be spent on more important tasks, and keep clients engaged through targeted messages. Businesses can integrate Appointment Reminder with their current booking calendar tool to automate reminders for scheduled bookings. When adding a booking to existing scheduling applications such as Google Calendar or Outlook, users can simply input the client's phone number to automatically schedule an email or SMS reminder before the appointment time. Users can customize parameters such as the timeframe in which reminders should be sent, the amount of reminders to send, the method of sending, and the script and language that should be used for each customer. In order to help reduce no-shows, timely reminders are automatically sent to customers. Customers are able to reply with confirmation, which then automatically updates the entry within the calendar tool and can be sent as an email notification to the relevant staff member. Reminders can be turned on or off for specific clients and users can choose from a variety of pre-written scripts depending on the type of service or customer. Our no-show, no-call rates have dropped because our clients are getting reminded of their appointments through phone, email and text.It's really easy to use and create multiple appointments. As a tax office, our January-April look a little hectic on the calendar and using Appointment Reminder is super easy to make sure all of our clients are getting contact prior to their appointment. It's really easy to use and create multiple appointments. As a tax office, our January-April look a little hectic on the calendar and using Appointment Reminder is super easy to make sure all of our clients are getting contact prior to their appointment. It can be a little difficult to schedule two appointments with the same start time, but it can be done! Our appointments are booked sometimes months in advance. If a client misses, it is hard to get them back in and if they miss, we can't fill the spot therefore lose revenue.It is very easy to use and update appointments for clients. They all love it and I love knowing they received their reminder - No excuses to miss! It is very easy to use and update appointments for clients. They all love it and I love knowing they received their reminder - No excuses to miss! The client list, when editing, always jumps back to the beginning of the list. We have used this software in our clinic for a few year now and it has fulfilled all of our scheduling needs and has been very easy to use. Nothing. It does exactly what we need it to. I do not have any current issues. Overall, things have gone quite well. It's very easy to learn and navigate through. It's very easy to learn and navigate through. It allows multiple profiles to save for the same patient. It does what it's supposed to, and does it well!Appointment Reminder is a software named for its task. It is a simple yet efficient tool for reminders. I have used this for a while and it has helped me to schedule daily appointments and tasks. It has an easy setup and launching. Many similar tools go over the top with many features that are never used, whole Appointment Reminder is straight to the point. Appointment Reminder is a software named for its task. It is a simple yet efficient tool for reminders. I have used this for a while and it has helped me to schedule daily appointments and tasks. It has an easy setup and launching. Many similar tools go over the top with many features that are never used, whole Appointment Reminder is straight to the point. A little bit expensive but its features justify its price. Add multiple calendar schedules to one Appointment Reminder account to send reminders to all clients regardless of which staff member scheduled the appointment. Import appointments and contacts for businesses that already use a different calendar system but want to import appointments so that reminders can be sent to their customers. Send scheduled and automatic SMS, email, or voice reminders to customers and allow them to reply, confirm or cancel their upcoming appointments. Confirmations are automatically displayed on the calendar entry and can be sent to staff via email. Categorize appointments by keywords. For example, write ‘no send’ anywhere in the appointment details to stop a reminder being sent to that particular customer. Choose from a variety of pre-built message templates with appointment details (such as date and time) automatically added in. Users can set up multiple languages or scripts for different customers and services. Below are some frequently asked questions for Appointment Reminder. Q. What type of pricing plans does Appointment Reminder offer? Q. Who are the typical users of Appointment Reminder? Q. What languages does Appointment Reminder support? Q. 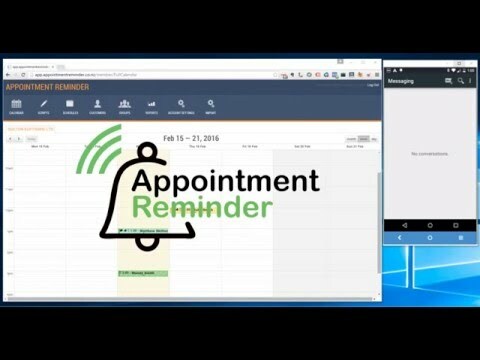 Does Appointment Reminder support mobile devices? Q. Does Appointment Reminder offer an API? No, Appointment Reminder does not have an API available. Q. What other apps does Appointment Reminder integrate with? Q. What level of support does Appointment Reminder offer?